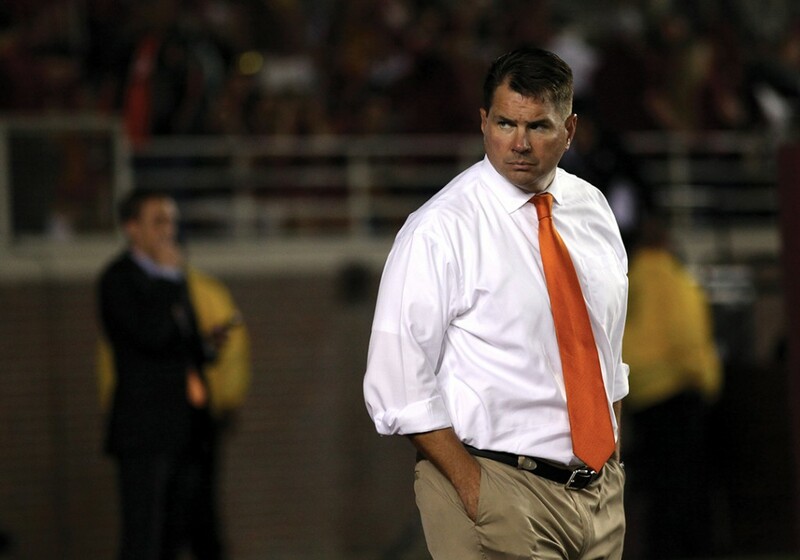 Al Golden watches the football team warm up at Doak Campbell Stadium before the game against FSU on Nov. 2 2013. File Photo. Five years later, fans hoping for a national championship – the last of which was in 2001 – have taken to Twitter to express their discontent, fueled by the hashtag “FireAlGolden.” Despite fans calling for his removal, Golden’s contract extends through the end of the 2019 season. While Golden had a strong start at the beginning of the 2013 season, he ended 2014 on a less-than-stellar note at 6-7, which included a bowl loss. Most of the fans using this hashtag disagree with Golden’s choices for the coaching staff and are dissatisfied with the team’s performance on the field. “Especially with this season, I think one can easily point to poor decision-making by the coaching staff as the main reason for the team’s struggles,” sophomore James Newlin said. Angry about the outcome of the recent bowl game against South Carolina, Newlin himself posted a tweet using the hashtag. He says he did so because that loss was upsetting for him. “We can never truly know what’s going on inside the football team; I think the easiest way for fans to express their frustration is to blame it on the coach,” Newlin said. Back in 2010, however, it seemed that Miami’s 22nd head football coach’s future would be golden. In his previous tenure at Philadelphia’s Temple University, he led the team to an 8-4 overall record, an improvement over its previous record of having only two winning seasons in 26 years. Despite backlash from fans, Golden has been recognized for his performance. In 2013, he received the Lombardi Award for Excellence in Coaching, which came at the heels of a 9-4 season that was on track to lead the Hurricanes to their first division title, only to be stopped by Florida State University during conference play. That season, Golden also coached the Hurricanes to a spot in the Russell Athletic Bowl in Orlando. This was Miami’s first bowl appearance since 2010 after the Nevin Shapiro ponzi scheme scandal. The subsequent NCAA investigation hurt recruitment and resulted in the removal of some scholarships in Golden’s first two seasons with UM. Despite the NCAA investigation, this did not hurt Golden’s ability to garner notable recruits, such as running back Duke Johnson and quarterback Brad Kaaya. Johnson recently decided to enter the 2015 NFL draft, and Kaaya was named ACC Rookie of the Year in 2014. Nevertheless, Johnson and Kaaya could not carry the team and prevent the outcome of the Duck Commander Independence Bowl held in December 2014. Under Golden, the team has an overall record of 28-22 and are 16-16 in the ACC. Former Hurricanes Head Coach Randy Shannon held the same record during the 2009 season as Golden’s 2013 peak. Shannon was terminated a year later. Among the other grievances, the similarity to Shannon’s record has prompted some fans to question Golden’s performance. “I think the fans are tired of being mediocre,” said Gerry Couzo, who has been attending UM football games since 1990, when his parents worked for the Miller School of Medicine. “It’s sad that we haven’t won a bowl game since 2006. … It’s also frustrating to see talent brought into this team year in and year out, flourish in the NFL but doing okay here at the U,” Couzo said. It’s sentiments like these that drive fans to social media to voice their concerns. Though the “FireAlGolden” hashtag has gained popularity this season, it is not new. The hashtag was first used in 2010 shortly after Golden was hired. It then popped up again in the 2011 season and has been used since. When games were lost or did not go as expected, fans took to Twitter, calling for the coach’s termination. Throughout the 2014 season, plane banners with the phrase printed on them were purchased and flown around Sun Life Stadium before games. Picket signs with “#FireAlGolden” written on them were even seen on national television during ESPN’s coverage of the national championship game held in Dallas, Texas on Jan. 12. Discontent for Golden also made its way to the basketball court. Staffers at the BankUnited Center (BUC) took away signs that read “Fire Al Golden” and “Bring Back Butch” from a student at men’s basketball games. According to an article in the Miami New Times, BUC security deemed the signs a distraction to fans. This led to an outpour of tweets and posts supporting the UM student and calling for an explanation from the university. According to a Miami Herald interview with Athletic Director Blake James, the BUC has a no-sign policy. However, screenshots on Billy Corben’s Twitter show that the no-sign policy did not show up on the venue’s website until Jan. 14, three days after the signs were confiscated. A representative from the BUC suggested that the no-sign policy is for customer service and safety purposes. Couzo, who has had season tickets since 2008, says that he thinks it’s not right to take signs from fans because “we have rights as Americans to voice how we feel.” He does, however, understand the problems these negative signs may pose when it comes time to recruit new players. “Certain recruits build a relationship with a coach, which is why they go to that school, so while on a visit if they attend a basketball game and see those signs they start to think, ‘Man, coach might not be here that long so let me not consider coming here.’ That’s the only way it’s a distraction in my opinion,” he said. “As long as the signs aren’t offensive, I don’t see how they can be that distracting,” he said. He also says he doesn’t see fans changing their tune any time soon. “I have friends on both sides of the issue, but I definitely think Coach Golden’s support among students is fading,” he said. Still, James says he is supportive of Golden and his efforts. “Coach Golden has helped guide Miami through some of our most challenging times and represents the university with class and integrity. He has worked hard to rebuild our program the right way,” he said. Which is more likely to happen? POLL: Which is more likely to happen?